Before Silver Cliff’s 1870s silver boom, a church in the Colfax Colony and a log cabin southwest of Silver Cliff served as Custer County’s only schools. When the populations of Silver Cliff and Westcliffe grew in 1879, Custer County formed its first school district. Rather than establishing one or two larger schools, the school district created 24 one-room schools and two classrooms in private homes. No school was more than five miles from another, guaranteeing a manageable walk for all students. In Custer County’s one-room schoolhouses, all ages learned together in rooms heated by wood-burning stoves. School years were limited to six months as winter conditions were too harsh for children walking to and from school. 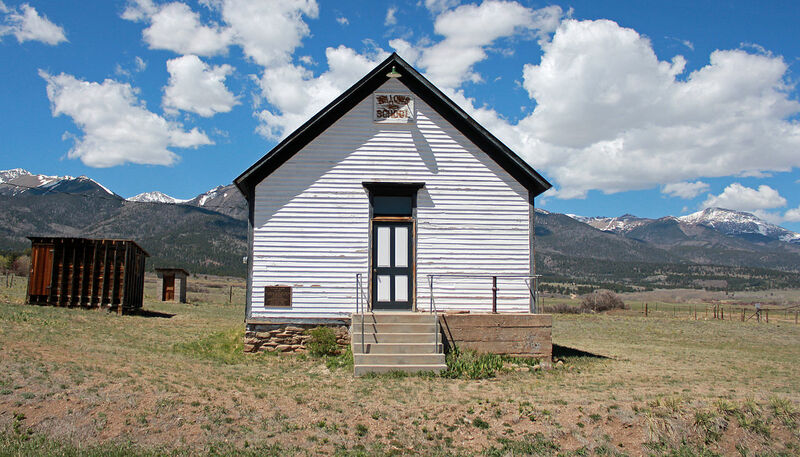 These rural schools also served as community buildings, election halls and churches. But with the closing of the mines, followed by the Great Depression and WWII, the era of the one-room schoolhouse ended. Today, two of Custer County’s original school houses still stand and are open to the public. This two-room school house is on the National Register of Historic Places. It’s home to the Museum of Westcliffe History and the Valley Parks and Recreation and Youth Center. It served as a school house from 1891 until 1953, and is characterized by its unusual, flat-topped gable roof and fieldstone façade. The rural, wood-framed Willows School operated from 1889 until 1948. Listed on the National and Colorado Registers of Historic Places in 1992, the schoolhouse has since been restored by the Historic Willows School Society.